New York, NY: Fine Communications, 1997. Text/BRAND NEW. Bi-color boards/Fine. Illustrated DJ/NF w/short closed tear to lower front edge. 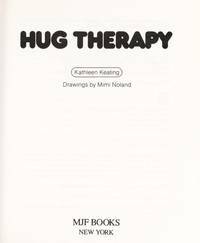 A compact, whimsically illustrated book extolling the power of hugs as an expression of friendship. Line drawings of gentle bears illustrate text, which guides one towards becoming a Master Hug Therapist.. First Edition, First Printing. Hard Cover. New/Near Fine. Illus. by Mimi Noland (Illustrator).